John started wrestling at the age of 7 and has won over 100 tournaments. John was 4 time Texas State Champion and won 4 other Texas State Championships before high School. He won Nationals 4 times and placed several times. John won the Junior Olympics Sambo, placed 3rd in Greco-Roman, and placed 5th in Freestyle. He was Team Captain and a varsity starter for 4 years at Trinity Christian Academy and was the first athlete in his high school to be named an All-American. He wrestled through college at Carson Newman College and graduated from Oklahoma Christian Academy with a degree in Management. Dustin Aguillard began wrestling in 7th grade in Lafayette, Louisiana wining state his 8th grade year. As a freshman, Dustin placed 6th in state for Comeaux High School in Lafayette, Louisiana and third as a sophomore. Dustin was a Louisiana State Champion his junior year and won third his senior year. During high school, he also was a three time Ken Cole champion, and won Louisiana's premiere Lee High tournament as a junior. Dustin earned a scholarship to wrestle at William Penn University in Oskaloosa, Iowa where he was a four year varsity wrestler and a four time national qualifier. 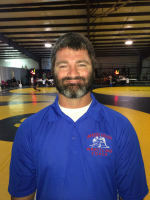 He has been coaching junior wrestling since graduating college in 2005.